On 7 March 2014, Piet Mondrian’s birthday, the RKD Netherlands Institute for Art History and the Huygens Institute for the History of the Netherlands – KNAW are embarking on a joint project to make all of Piet Mondrian’s letters and writings accessible online. This, at last, is the fulfilment of a wish cherished for more than 40 years by scholars and art lovers worldwide. The complete publication of all of Piet Mondrian’s letters and theoretical writings is an ambitious, multi-year project. It will start with a pilot in which both Institutions, joined by the Gemeentemuseum The Hague, will carefully identify all the relevant aspects and publish a selection of the material. The purpose of the pilot is to attract sufficient financial support for the full project. 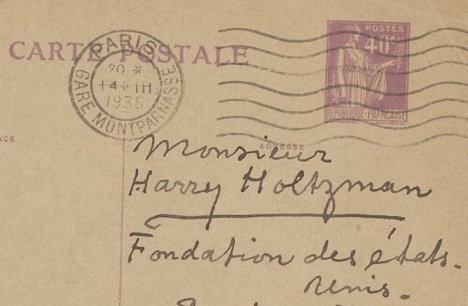 The publication will comprise the correspondence that Mondrian conducted between 1935 and 1943 with his good friend and later heir Harry Holtzman (1912-1987). 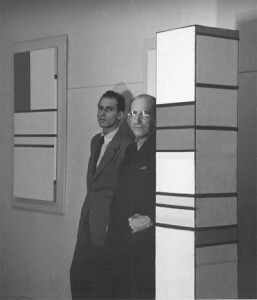 Their friendship was important to Piet Mondrian, because Harry Holtzman provided him with material support in the closing years of his life and enabled him to make the crossing from London to New York. Mondrian does not just write regularly about his art in the letters but also about his personal life, including his concern about the rise of the Nazi regime. The RKD acquired this remarkable collection of 54 letters in January 2012. The RKD’s Mondrian collection consists of around 1,500 letters, theoretical writings, notebooks, portrait and studio photographs and other documents. This collection will undoubtedly be supplemented with this far unknown archival material in the course of the project. The criteria for the integral edition will be explored and defined in the pilot with the aid of a representative sample of letters and theoretical writings. The objective of the full project is to make all the archival material on Piet Mondrian available in reliable scholarly transcriptions, annotations and documentation in both the original language and English. It will be lavishly illustrated with reproductions of works of art, portrait and studio photographs and other related documents. The ultimate aim is to present an extensive, but also more nuanced, picture of Piet Mondrian’s life and work. The scholarly, high-quality and multilingual digital edition will be completed in 2020. It will be comparable to the highly praised Vincent van Gogh – The Letters that was published by the Van Gogh Museum and Huygens ING in 2009. After the acquisition of Piet Mondrian’s personal archive in 2012 and the launch of the http://www.mondriaan.nl/ website in 2013 together with the Gemeentemuseum in The Hague, this joint project on the part of the RKD and Huygens ING represents a new step in the research on and dissemination of the work and ideas of this great Dutch artist. The pilot for the Mondrian Edition Project was made possible by a subsidy from the SNS Reaal Fonds.